OM4 MTP/MPO to MTP/MPO 12 Strand Multi-Fiber Patch Cable. MTP to MTP female (no pins), OFNP Multimode 50/125 100Gb Corning fiber, each with 125 micron cladding. MTP/MPO female fiber connectors with 12 OM4 multimode fiber strands. 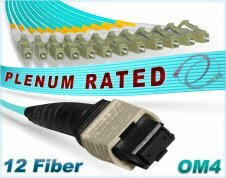 MPO 12 fiber connector on both sides of this multi-fiber, high density, optical patch cord with 12 Laser-Optimized Multimode Fiber (LOMMF) 100Gb rated fiber cores. Connector Type MTP/MPO to MTP/MPO 12 Fiber Patch Cable | MTP Compatible, Female to Female (no pins). Multi-Fiber, Optical Assembly. OM4 MPO/MTP to MTP/MPO 12 Strand Multi-fiber patch cable assembly, OFNP Plenum, 100Gb Multimode 50/125 Corning optical fiber cores/cladding. Connector 1 is terminated with a MTP female (no pins) multi-fiber push-on style contact connection. Connector 2 is also terminated with a MTP female (no pins) multi-fiber push-on style contact connection for reliable connectivity in compact, high density fiber patch cable environments. Each MPO/MTP multi-fiber connector has 12 x 50/125 optical fiber strands in a plenum jacket that is fire retardant, water resistant and free from electromagnetic interference. Method B Polarity: This fiber MTP/MPO patch cable uses Method Type B Fiber Polarity, the most commonly used method. Type B polarity uses key up connectors on both ends so fiber Position 1 (Tx) arrives at Position 12 (Rx) on the other end, Position 2 (Rx) fiber arrives at Position 11 (Tx) at the other end, etc. Each fiber optic cable assembly ordered from FiberCablesDirect is individually tested and bagged with test results inside. We also provide a Lifetime warranty on all our products. Orders for Om4 MPO to MPO 12 strand fiber patch cables above 35 meters may require an additional 1 to 2 days to ship depending on the quantity ordered. However, most orders ship within 24 hours or less. Warranty: This MTP/MPO to MTP/MPO fiber patch cable comes with a Lifetime warranty.